Do you want to save big $ off your new kitchen and have the best appliances money can buy? Unique Design and Kleenmaid have partnered to offer you exactly that. 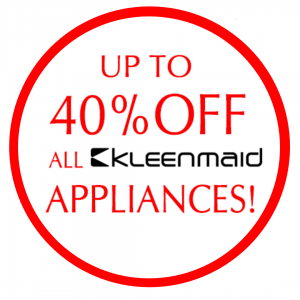 By purchasing one of Unique Design's amazing quality kitchens and adding Kleenmaid’s state of the art appliances, We can offer you up to 40% of the appliance price as a discount off your kitchen paid to you by Kleenmaid Appliances.